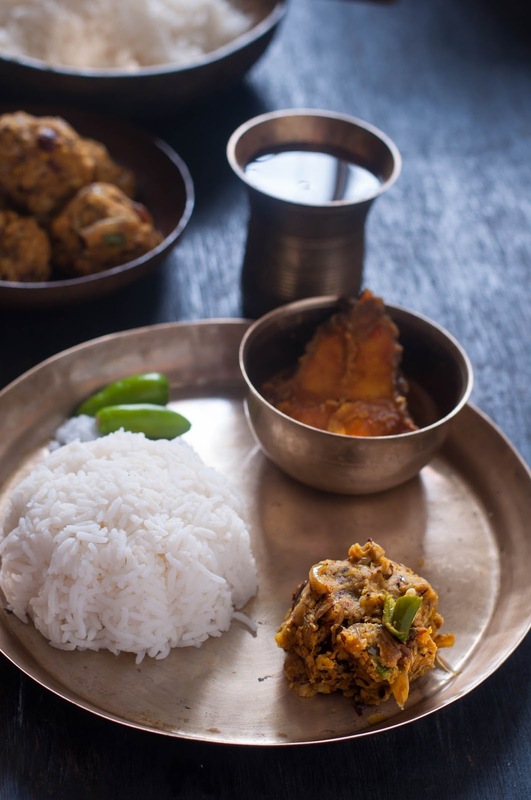 In the coastal areas of Midnapore though we have our fair share of mashes which are boiled, burnt, steamed or lightly fried veggies/ fish/ crustacians / sundried lentil dumplings or bori - mashed by hand with onion and chilies. but they are distinctly different in taste and flavour. 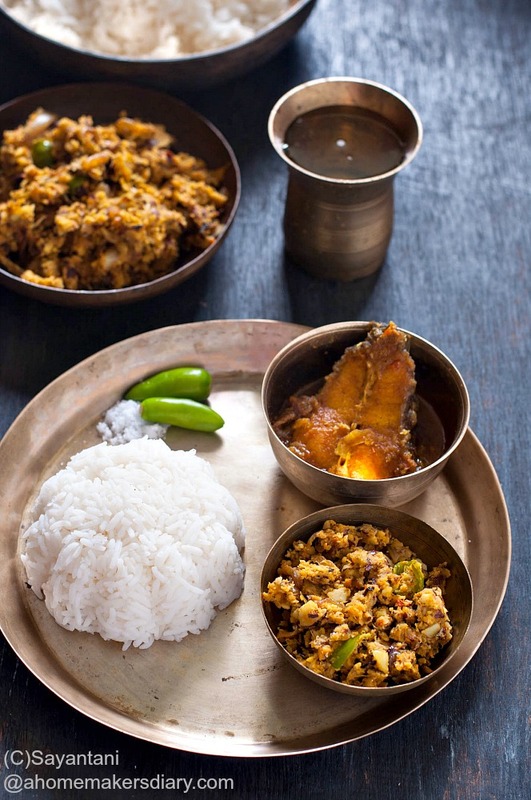 This world of spicy bhorta is completely an import from our Bangladeshi counter parts where bhorta is a daily affair yet celebrated on special occasions like Bengali new year. Veggies, leaves, peels, seeds, fish, chicken, dry fish, crustaceans...you name it and Bangladeshis have bhorta recipes featuring them. The most alluring is the fact that these are made with very few regular pantry staples and following a couple of simple steps. 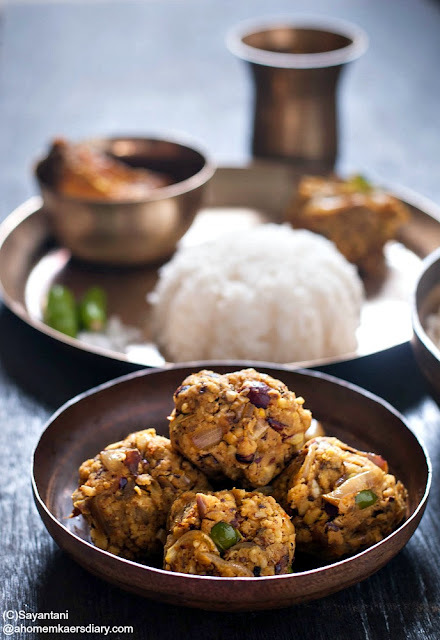 In most recipes the main ingredient is either steamed or sauteed in mustard oil along with onion, garlic and chillies and then a coarse semi dry or thick paste is made in the traditional mortar and pestle. 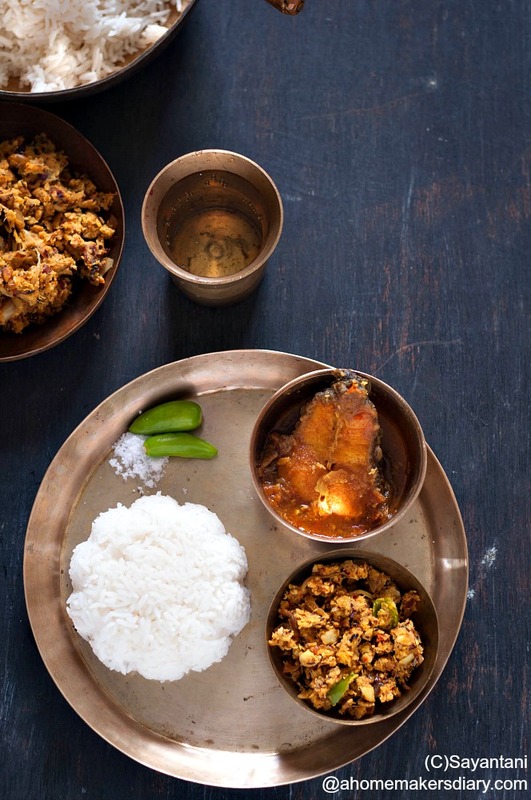 This jackfruit seeds bhorta is a fine example of how something as mundane as jackfruit seeds could be turned into such an satisfying and nutritious side dish. If you dont trust me ask my family. Even my 8 years old kid will swear by this and would demand this to be made almost everyday during Summer. Though my mother has always made Chingri Mola (prawn mash), Alumakha (mashed potato with onion, roasted red chilies), Kumro makha (mashed pumpkin), kochubata (ground taro with coconut and spices), pata bata (edible leaves paste), kanchkolar khosa bata (palntain peel mash) etc but never never this kanthal bichir bhorta. 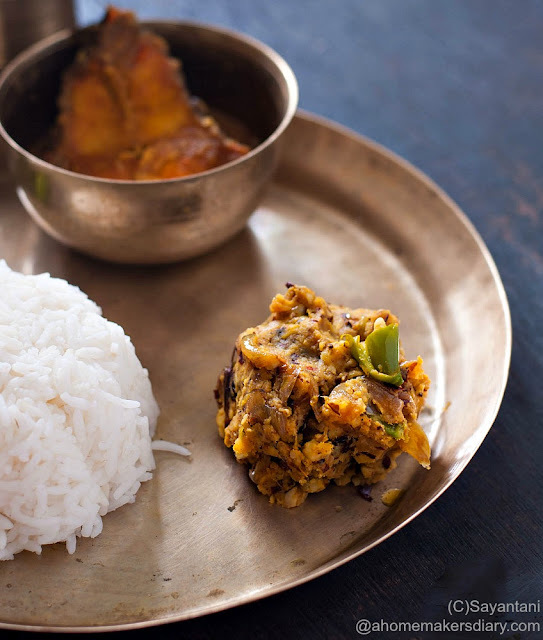 It's a completely new recipe for me which Somnathda an enthusiastic foodie and gentleman extraordinaire kindly shared. Though he suggested to use dry prawns but for quick preparation I have used fresh shrimps instead and the end result is something truly soul satisfying. On another note to know more about Jackfruit seeds or for other recipes please see the following links. JAckfruit seeds have a thick white outer layer that easily comes off when dry. But it's difficult to peel when the seeds are fresh. So if you have time just sundry the seeds for a day and remove this layer. OR cut the seeds in half and remove the peels. Either way wash the seeds very well. Take a small heavy base pan and place the seeds with 1/2 cup water and a pinch of salt. Cover and let it boil on low flame till the wtaer is absorbed (7-9 minutes). Now add 1 tsp oil to it and on low flame saute it for 5-6 minutes or till char marks start to appear on the brown skin. Remove and keep aside. While the seeds are boiling finely slice the onion, slit the green chillies and clean and remove the skin, legs and tail of the shrimps. Mix it with little salt and turmeric keep aside. Once the seeds are boiled in the same pan add 1/2 tsp oil and fry the shrimps for a couple of minutes. Take out and keep aside. In the same pan add 1 tsp more oil and add the garlic and dry red chillies. On slow flame fry till they turn a few shades darker. Take out. Add rest of the oil and fry the onion and green chillies till they are browned. Take off Heat. In a shil nora first make a coarse paste of the garlic and dry chili. Add the prawn and seeds and break them and make a very coarse paste of it. Take out and in a big bowl mash this with the tip of your fingers with the fried onion, green chillies, the oil and salt. Serve with steamed white rice with more mustard oil poured on top.